These tips reduce stress related to vet visits that may stem from cat carriers, car rides, waiting rooms and invasive exams. No one looks forward to vet visits. Generally, no aspect of these outings is the high point of the day for cats or their owners, whether it’s extricating kitties out of hiding places, stuffing cats into carriers, or cats being poked and prodded by veterinarians. Although the visits are not pleasant, cats need veterinarian-health checks at least once a year. Additionally, illness, teeth-cleanings, and changes in behavior can warrant additional vet visits. Although cats and owners might never look forward to these visits, they can become less stressful and traumatic for everyone. Here are some tips. Change your cat’s negative feelings about her carrier into positive ones. Cat in carrier. Photography by Shutterstock. Many cats instantly disappear as soon as the dreaded carrier looms into view. Based on their past experiences, nothing about the carriers is pleasant. It’s understandable why felines will do everything they can to avoid being caught and stuffed into them. Yet the cat carrier can become fun to hang out in instead of an evil, threatening place. Instead of retrieving it from the closet or garage when it’s time to transport your kitty to frightening and unknown locations, treat the cat carrier as furniture. 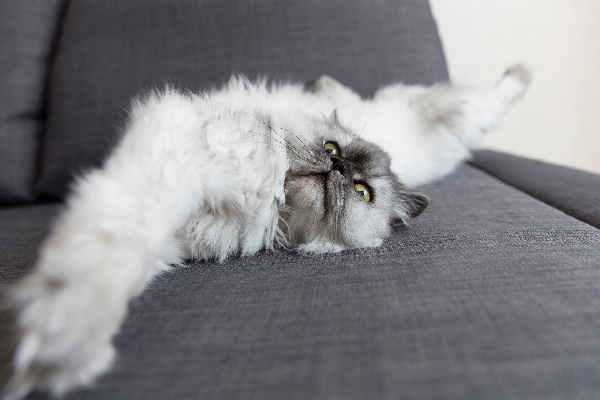 It becomes a fixture, like a chair or a sofa, that is placed where your cat enjoys hanging out. It shouldn’t magically appear only when it’s time for vet visits. The next step to change your kitty’s negative association with the carrier is to convert it into a place where good things happen. 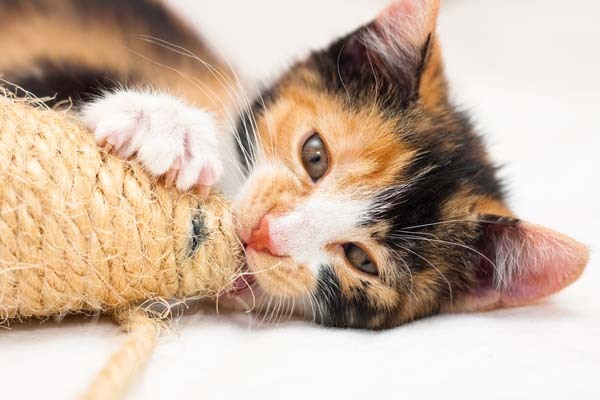 Do this by playing with your feline around the carrier, throwing favorite toys in it and dragging toys around it. Placing small towels or clothing that have your scent on them in the carrier will also help reassure her. Tossing in treats that your cat adores can help change her point of view about it as well. Cats willingly settle into carriers when there is no negative stigma about them. 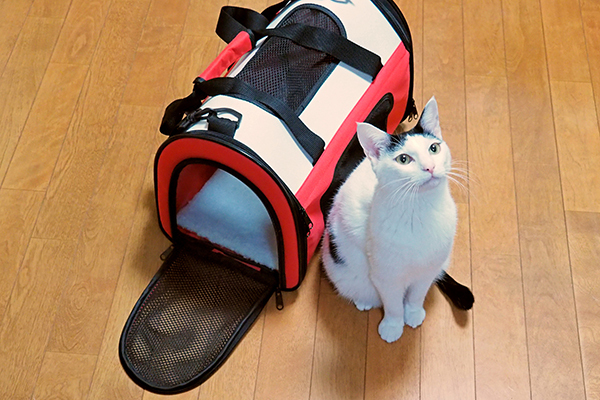 A black and white cat sitting next to a cat carrier. For some cats, car rides are stress-free — while others spend the whole trip unhappily protesting with loud yowls. Anxious kitties can be gradually acclimated to riding in automobiles by making the experience as stress-free as possible. The time to help your cat adjust to car rides is after she easily hangs out in the carrier. Put soft towels along with an item of clothing that has your scent on it in the carrier. Your scent will help comfort the little one. Cover the carrier loosely with a towel. Start a couple of weeks before vet visits. Place the towel-covered carrier, with the cat inside, on the floor behind the front seat. 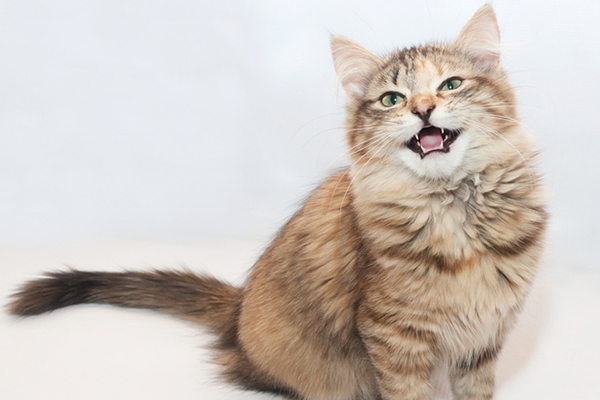 Reassure your cat with a calm voice. Repeat this a few times, and when she seems relaxed, start the car but do not drive it. After she is acclimated to the sound and vibration, drive the car a short distance. Repeat this every day, taking her on short car rides. To reduce the possibility of motion sickness, don’t feed her for several hours before hitting the road. Always be on time to veterinarian appointments. A vet’s waiting room. Photography by Shutterstock. Waiting rooms can be nightmarish, especially when shared with other anxious, unhappy animals who aren’t thrilled to be there. Some vet clinics, hoping to reduce the anxieties of their four-pawed patients, provide separate waiting areas for cats and dogs. Other clinics specialize only in felines. Although these solutions are immensely helpful, most kitties become anxious in waiting rooms. Feeling under the weather also doesn’t help their moods. Understandably, their people are also worried. In an ideal world, you can arrange beforehand to take your cat directly into the examination room and avoid the waiting room. Unfortunately, clinics usually don’t have exam rooms immediately available upon arrival. You can make the waiting room experience a little more tolerable by positioning the carrier so that it faces a wall or back of a couch or chair. Although it’s not always possible, seek out a quiet place to sit that is animal-free. Cover the carrier with the towel and stay with your kitty — reassure her by talking softly to her and letting her smell your fingers. Cats usually don’t feel social when they’re in veterinary clinics. Politely discourage other cat lovers from becoming overly friendly with your kitty. Attention from strangers can be stressful, especially for cats who are trying to be inconspicuous. Timing is important too. Be on time — don’t arrive too early and don’t be late. You don’t want to wait a long time to see the vet, and the vet shouldn’t wait for you. Before the veterinarian examines the cat tell him/her about the cat. A woman and her cat at the vet by Shutterstock. Many cats are dead set against being hauled out of carriers and checked by veterinarians and vet techs. They are very successful at communicating their intentions through hisses, loud wails, and overall fractiousness. Typically these protests are directed at anyone who tries to handle them. Sometimes it is impossible to examine them. A few changes can make the exam easier and less stressful for everyone. Acquaint the vet with your cat before the examination by having a conversation with him. In addition to the reason for the visit, tell him whether your cat is calm, easily stressed, or fractious. The least stressful way of examining cats is in their carriers. If you have a hard-sided, two piece or top-loading carrier, remove the top. Temporarily cover your cat with the towel so that she feels somewhat protected and hidden from view. Discourage personnel from scruffing and dragging her out of the carrier. That removal method stresses cats and can make the examinations difficult. In order to complete the examination, your cat will need to be lifted from the carrier and placed on the vet exam table. Vet exam tables are cold and hard. Placing the familiar towel on the table can be comforting to the cat — the towel warms up the surface and makes it a little softer. During the exam, ask your veterinarian to first present the diagnostic instruments to your cat for a sniff so that she becomes somewhat familiar with their smell, feel and temperature. Vet visits are a necessity. 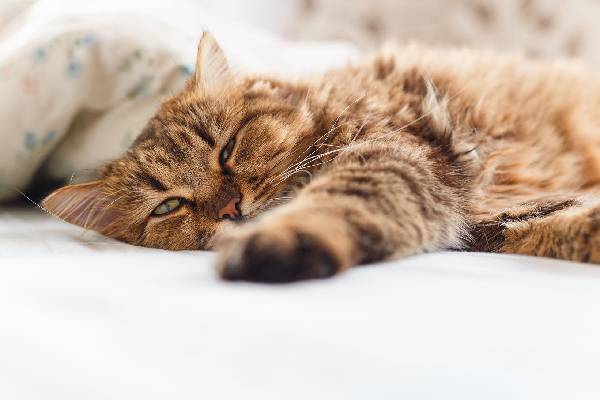 Although they are never fun, the stress and trauma can be greatly reduced, making the vet clinic experiences easier for everyone, including cats, their owners and the veterinarians. Ask a Vet: Why Are Some Cats Holy Terrors During Vet Visits? Should You Bring Your Kids to Your Cat’s Vet Visit? Marilyn, a certified cat behavior consultant, owner of The Cat Coach, LLC, solves cat behavior problems nationally and internationally through on site, Skype and phone consultations. She uses positive reinforcement, including environmental changes, management, clicker training and other behavior modification techniques. She is also an award winning author. Her book Naughty No More! focuses on solving cat behavior problems through clicker training and other positive reinforcement methods. Marilyn is big on education—she feels it is important for cat parents to know the reasons behind their cat’s behaviors. She is a frequent guest on television and radio, answering cat behavior questions and helping people understand their cats. I like that you mentioned to take your cat for some practice car rides so they can get used to it. It makes sense that this could relieve a lot of the stress involved with going to the vet. I have a cat that always gets really nervous during vet visits. I will try this tip and see if it helps, thanks a lot!